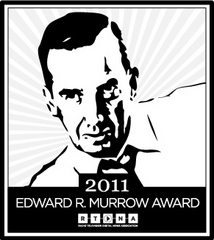 These pieces won Edward R. Murrow awards in 2011. Are we missing yours? Send us the PRX link! Brew the coffee, turn on the radio, and check your electronic mail – you’re on your way to burning 20 pounds of coal for the day. That’s how much coal the average American uses. No matter what, we all have a stake in coal’s future. This hour-long documentary takes an in-depth look at that future. This documentary will take your listeners on a journey from their light switch back to America’s coal fields. We start at Thomas Edison’s Menlo Park Lab; visit a coal-burning power generating station; go down into a coal mine in Illinois; travel to the rural counties of West Virginia where mountaintop mining is pulling on the state’s social fabric; and take a closer look at the technologies that promise to deliver coal into the new green economy. The Environment Report’s documentary explores the effects of coal in our lives and in the lives of those who depend on coal for a living. The documentary is also available on Content Depot. A big thanks to the people at the Joyce Foundation for providing the funding for this special project. See below for rundown information. A half-hour documentary that examines the challenging counter-insurgency mission of the National Guard and how the Guard is training the Afghan Police. The war in Afghanistan is no longer solely a fight against insurgents. In fact, training the country's security forces and building relationships are now central to the U.S. military's mission in Afghanistan and critical to any plans to withdraw troops. That means soldiers have had to adjust to a new role where the tools are words, not weapons. Vermont Public Radio Reporter Steve Zind spent three weeks with National Guard soldiers in Afghanistan this fall. In this documentary, he takes us on patrols and to police training sessions to learn how soldiers carried out their complex mission and how they view the prospects for success. The Peabody Award winning investigation into child prostitution in Oakland, CA. In the second half of our series Trafficked, we’ll hear how city police and community groups are fighting to save kids from the streets. According to the Oakland Attorney’s office, a mid-level pimp trafficking just four girls can make more than 500 thousand dollars a year marketing those girls on the street and online. Police say there are criminal networks that are moving into sexual exploitation of minors. The money is as good as selling drugs and safer. That’s because few are prosecuted and prison sentences are relatively short. Youth Radio’s Denise Tejada and Brett Myers have the story. “Grounded: The End of the Shuttle Era and the Future of Manned Space Flight,” is a special report from KUT News exploring mission, place and what it has meant to millions of Texans to live in the space state. Over the course of the hour we revisit the launch of U.S. space mission, explore the history of the shuttle program, and what it all meant for Texas. There’s a wonderful history of the space program and a sound portrait of major event in the shuttle’s history that are applicable to a broad audience. There’s also a story on the future of manned space flight that has broad appeal. “Grounded: The End of the Shuttle Era and the Future of Manned Space Flight,” is a special report from KUT News exploring mission, place and what it has meant to millions of Texans to live in the space state. Over the course of the hour we revisit the launch of U.S. space mission, explore the history of the shuttle program, and what it all meant for Texas. There’s a wonderful history of the space program and a sound portrait of major event in the shuttle’s history that are applicable to a broad audience. There’s also a story on the future of manned space flight that has broad appeal.